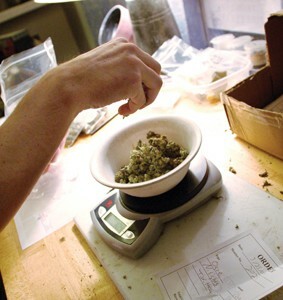 Weighty Choices: While it's entirely possible that medicinal marijuana patients won't be prosecuted, it's entirely possible they will. Chalk up yet another positive effect for medical marijuana: The substance seems to make those who use it feel eternally optimistic. How else to explain the overwhelmingly positive reaction to the U.S. Supreme Court's June 6 ruling against medical marijuana? "It's the best defeat we could have gotten," says Steph Sherer, a medical marijuana patient who is also the founder and executive director of Americans for Safety Access (ASA), the Oakland-based national grassroots organization that advocates for the rights of patients and doctors to use medical cannabis. Although the justices voted 6 to 3 that the Controlled Substances Act permits federal law-enforcement officials to prosecute medical marijuana users in the 10 states where voters have passed initiatives allowing its use, including California, Sherer and other advocates have found plenty of things to feel high about within the language of the court's decision. "According to the Supreme Court decision, the federal government can prosecute medical marijuana patients--it does not say they must prosecute patients," she says. "The Drug Enforcement Agency busting California's sick and dying would be like one of our local police departments pulling all their women and men off their assigned duties and making them all focus on jaywalkers." That of course hasn't happened--yet. It didn't hurt that the state's chief law-enforcement official, Attorney General Bill Lockyer, wasted no time assuring medical marijuana patients that they would not be persecuted. "Today's ruling does not overturn California law permitting the use of medical marijuana," Lockyer said in a written statement released shortly after the Supreme Court's decision. "It does uphold a federal regulatory scheme that contradicts the will of the California voters and limits the rights of states to provide appropriate medical care to its citizens." Nevertheless, some local medical marijuana users took the news of the Supreme Court's ruling pretty hard. "I've had people calling me all day asking if everything has been banned," explains Jose Gutierrez, ASA's representative in Sonoma County, where a ban on new cannabis clubs is in effect. "I'm really seeing the effects of the media. We've been inundated with so much fear lately, and this has really freaked [patients] out. They feel like they may be on a list because they signed up for medical marijuana, and they might get arrested if a dispensary gets raided. "To help counter that fear, Gutierrez organized a candlelight vigil in downtown Santa Rosa last week; about 40 medical marijuana users and their supporters showed up, along with a four-foot-tall marijuana plant belonging to the potent strain known as "Sonoma Coma." "I am not a damned criminal!" cried a patient named Cecelia. "If they want to call me a criminal, they're liars. They know it, and God knows it." Said Stacey of her wheelchair-bound son Forest, "Medical marijuana has kept him alive." The vigil's ending was punctuated by the pungent odor of high-grade skunk-bud as patients toked up before returning home. Like Stacey, Mary Pat Jacobs, a spokeswoman for the Sonoma Alliance for Medical Marijuana, credits medical marijuana for keeping a loved one alive. Her husband, Monte, suffers from a rare condition called radiation necrosis that's like a sunburn that goes clean through to the bone. She believes marijuana's scientifically documented abilities to stimulate the appetite and relieve pain has prolonged her husband's life, and while she's not a patient herself, she has the same eternal optimism regarding the recent Supreme Court decision displayed by most medical marijuana advocates. "For all practical purposes, [the court decision] doesn't change what's been happening," she says. "If the federal government comes after patients like Monte, it's not going to look good. I think this Supreme Court decision is going to make a lot of people angry. I think it's going to give us a boost. It doesn't change the situation in California. We've always been worried about the federal government coming in." The Jacobs are friends with Angel Raich, the respondent in the Supreme Court case, who like Monte credits medical marijuana for prolonging her life. Raich suffers from an inoperable brain tumor along with wasting syndrome, and successfully sued the federal government for the right to use medical marijuana under California law until the Supreme Court reversed the decision. "Angel is a good friend of ours," Jacobs says. "Monte was really impressed with her when they first met. She can vaporize as much as he can." "Vaporization" is a process for heating and consuming marijuana that does not burn the weed and is therefore easier on the lungs. Monte eats and vaporizes 13 grams of medical marijuana per day, which amounts to 10.5 pounds per year, an amount that exceeds the Sonoma County guidelines of three pounds per year but is permitted with a special exemption approved by his physician. Jacobs doesn't think the Supreme Court decision was entirely positive. Although she and her husband grow their own medical marijuana, many patients cannot and so depend on the cannabis clubs, which have recently come under increasing scrutiny in Sonoma County. "We fear the dispensaries are going to be at continued risk from the federal government," Jacobs says. "The dispensaries have surfaced, in our opinion, because neither the state nor the federal government has stepped forward with a safe and affordable supply. A ban on clubs and dispensaries would push it all back underground. Prohibition just makes it more unsafe for patients. It's just amazing that a country that tolerates tobacco and alcohol can't tolerate a substance like cannabis." Americans for Safety Access' Steph Sherer agrees that there are negative aspects about the court's decision. "The downside is that there are a dozen people out there who were waiting for the results of this case and may have to go prison now," she says. That includes Chico medical marijuana dispensary operator Brian Epis, whose 10-year prison sentence on federal conspiracy charges to cultivate marijuana was overturned in part because Raich won in the 9th District Court of Appeals. Now that her victory has been overturned, Epis and others in similar situations could be facing prison once more. Yet for the most part, Sherer remains optimistic, particularly since the justices suggested that Congress should consider rescheduling marijuana under the Controlled Substances Act, first established in 1972 by the Nixon administration. As it so happens, Sherer and the ASA have been working hard on doing just that, and may be on the verge of success. The Controlled Substances Act ranks drugs in five separate schedules; marijuana is placed in schedule one, among the hardest drugs such as heroin. To classify for schedule one, a substance can have no known or accepted medical use--for example, cocaine and morphine, arguably much harder than marijuana, are classified as schedule two, because they have medical uses. Who decides if a substance has a medical use? Ultimately, it's the U.S. Department of Health and Human Services (HHS), which for decades has ignored the growing scientific evidence of medical marijuana's efficacy, the ASA claims. To rectify that situation, ASA filed a petition with the HHS last October to reschedule marijuana. As part of the process, ASA has demanded that the agency abide by the Data Quality Act, federal law that requires such agencies to make decisions based on science, not politics. In a brief filed in the case, the ASA states that "HHS's statements about marijuana as medicine violate the date quality act's utility and objective standards because those statements do not reveal the data on which they are based, ignore opposing peer-reviewed scientific studies and have been contradicted by new data." If the agency is in fact in violation of the Data Quality Act, and HHS is forced to concede that marijuana does indeed have legitimate medical uses, it would by definition have to be rescheduled under the Controlled Substances Act. A decision on the Data Quality Act portion of the ASA's petition is due from HHS later this summer. Health and Human Services must reply to ASA's petition for rescheduling marijuana by the end of the year. Is it possible that HHS, run by the science-averse Bush administration, might do the right thing and reschedule marijuana, thus ending the national debate on the issue? "They have an opportunity to take the politics out of this issue and look at the merits of the case," says the eternally optimistic Sherer. "Maybe I'm just naïve--to a certain degree, you have to be to be an activist--but I believe there's always the possibility that they'll do their job, which is to take the politics out of medicine." From the June 15-21, 2005 issue of the North Bay Bohemian.